Robert Bower, who inherited the estate after the years of mismanagement, must have agreed to the request for improvements for, in 1855, he commissioned a survey which gives a good picture of the buildings lived and worked in by the Saint family. And mentions the “new building—presumably the Manufactory of the title. It is interesting to bear in mind that the census of 1851 gives the names of twelve people living in “The Dye House”, presumably the three roomed dwelling house of the survey rather than the two roomed dyehouse in which the work took place. These include the widower Joseph Saint age 56, his son Joseph aged 14, a house servant and the families of two weavers and a spinner, presumably some of Saint’s employees. At this time he was employing 14 men in his dyeing works and woollen mill: a major employer, living on his leased business premises with his workmen. The lessee of the mill and land was one Mr. Smith who we know from Joseph Saint’s letter leased the Mill to him. Interestingly, the description of the “large building... with three floors” would fit the existing building at Town Foot so it would be tempting to assume that if Robert Bower re-built Saint’s Mill, he built something very similar to the older structure. The oldest depiction yet found of the Mill at town foot is on a map drawn in 1838. It shows a simple rectangular building. At this stage in the development of the industry the stocks would have occupied the lowest floor ( to minimise the effects of the colossal vibration) with weaving above and spinning on the top floor. By 1860s the ordnance survey map shows a much larger building than both the one described in the 1850 survey and that which survives today. If the drawing of the building is perfectly to scale it would have been a T shaped building 22.5 M by 5M crossed by a wider building, 22.5M by 7.5 M. The alignment of the current building runs parallel to the road and corresponds with that of the narrow section of the structure shown on the 1860 map. The wheel, which was attached to the north west wall of the original building and sunk into a deep wheel-pit, would have become enclosed when the new wing was added. This is not an unusual arrangement as it ensures that the mill wheel can operate in all seasons, even at temperatures below freezing. It seems likely that the stocks continues to be housed on the lowest floor of the main building whilst the northern building was added to house the new power-driven weaving frames. Perhaps this wing was the “New Building containing byre for 4 cows, two-stall stable, barn and pig house with a large weaving room above, the whole of stone with blue slate” mentioned in the 1855 survey. A question remains as to the motive power for the weaving frames. Experts in watermill technology have suggested that there would have been insufficient power from the mill wheel to drive the frames implying that the new machinery was steam driven. 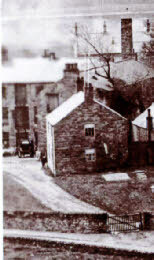 Support to this idea comes from the only photograph we have of the mill building (left) which seems to show a tall square chimney at the far end. Perhaps the steam-driven machinery was the factor which enabled Saint’s Mill to succeed through to the 20th century whilst the High and Low Mills ceased production in the 1860s. Between the drawing of the maps of 1838 and 1860, a second building, southeast of the mill has been added to the complex. This is now known as “The Old Dye House” but it is clear from the 1838 map, which appears to depict the Townfoot area very accurately, and upon which it does not occur, that it was constructed after this time and is therefore unlikely to have been the building complained of by Joseph Saint in his 1837 letter - “the roof of the dyehouse has fallen in this spring”. It seems possible it was the building, described in the 1856 survey, as being built of stone and covered in thatch- probably heather thatch. 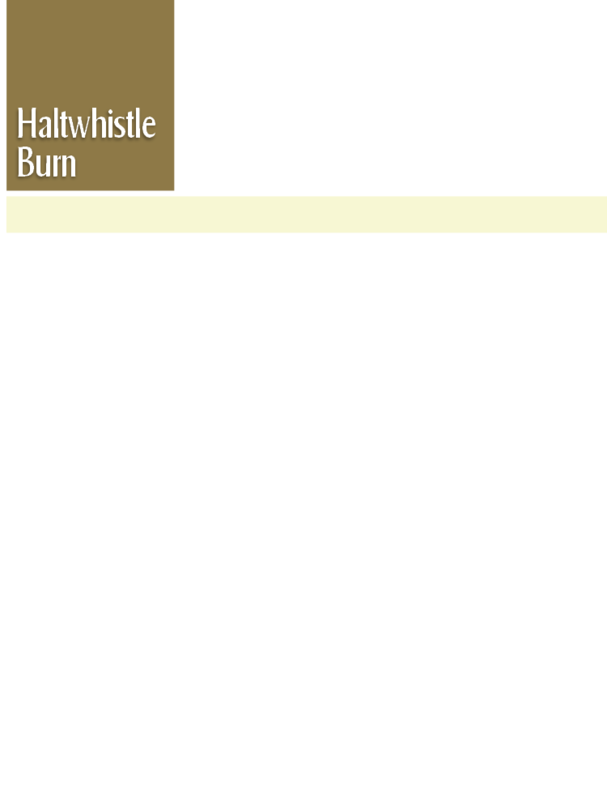 It is perhaps surprising that a building constructed at this late date should have been thatched, a material usually associated with older buildings but it is worth noting that many building in Haltwhistle were thatched at that time and that many in the the neighbouring village of Bardon Mill were heather thatched right into the 20th century (one still is). In living memory this “dyehouse” building has only been a farm house and barn with no connection to the mill building and one elderly resident recalls that “the dyehouse” was on the other side of the main mill building right beside the mill race - a more likely position, perhaps, for a process which required copious supplies of water.